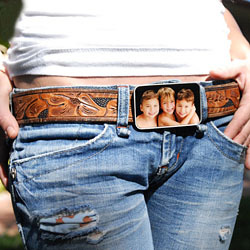 I think all of you seen those cowboy guys with their belt buckles as huge as their hands, so it stands to reason that someone should put a picture on a belt buckle. A company called Kimbra Studios has figured out a way to do this with some new technology that they were showing off at the PhotoPlus Expo in New York. All a user needs to do is go to the Web Site and select the belt buckle option. By the way, you can also request other pieces of jewelry such as a bracelet for your photos. The company website allows you to upload the photos, and you should receive your photogenic buckle or other piece of jewelry at your door within two to three weeks. So it sounds like you will have yet another way to proudly display your photos. I have to admit that I like this technology, but the picture that you see here looks a tad touched up. In fact, what interested me in this product was it looked like this person has an iPhone on their waist. I could easily make an inappropriate joke such as “is that an iPhone on your waist, or…” I won’t make that joke, of course. If you want in on this tech, the prices vary. The lowest priced item is a mobile phone charm at $14, but the bracelet will set you back $260. I know at the design shop I work at we can do things very similar to this its called sublimation. The process itself is fairly cheap so I’m really hoping that the insane cost comes from the product surrounding the picture.